Rebecca has been playing the violin since age two. 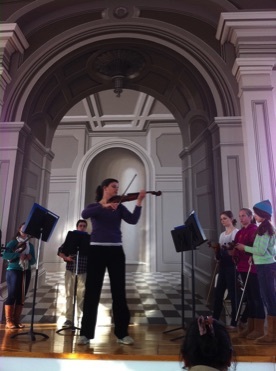 She began her studies with Carol Sykes and was a member of the Young Peoples String Concert. In 1985 Rebecca continued her musical education at Ithaca College. While there she studied with Philip Clark, Linda Case and Pamela Gearhart. Rebecca has been teaching since she was 16 years old. Rebecca believes that to be a good teacher you must learn from your students as much as they learn from you. In 1993 Rebecca retired from the school system to begin a family and run her private violin studio. Rebecca teaches all ages from 18 months to senior citizens. She teaches lessons at her home as well as teaching a pre-school class at the Chilmark Pre-School once a week. Rebecca has performed in a variety of venues on the Vineyard but most frequently with her husband Michael for weddings and special occasions. 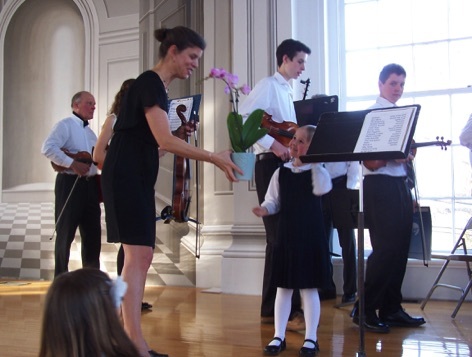 In addition to maintaining a private string studio, Rebecca works part-time at the Chilmark School as the Teachnology Support Coordinator. In the summer 1991 Michael Tinus was blown onto the shores of Martha’s Vineyard as Hurricane Bob was making its exit. Since then he has been treating students and audiences alike with his many musical talents. At the age of nine Michael began playing the upright bass in his home town of Camillus, New York. He received a BA of Music Education from Ithaca College in 1986 and in 1991 a Master of Music Performance from Michigan State University. 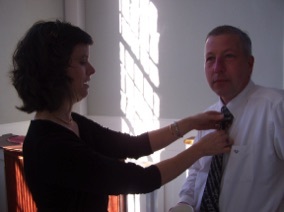 Currently Michael holds the position of instrumental music teacher at Martha’s Vineyard Regional High School. 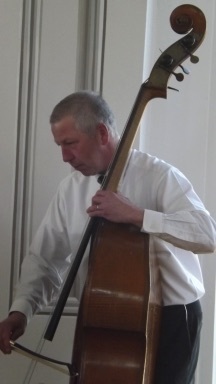 He teaches concert band, string orchestra, jazz band, class guitar, and sound technology, . He is widely recognized as a proficient performer in Jazz, Classical and Rock music. Michael is a member of the John Aliamo Trio which has released several CD’s. He also performs in a classical duet with his wife Rebecca. Michael and Rebecca live in Oak Bluffs with their two daughters Amalie and Mikayla.